Pycon India concluded last weekend at Indian Institute of Science, Bangalore. There have been so many python/django conferences recently, I have been tracking them literally all through the year. Another one, SciPy India just got announced. Week long, with sprints! Pycon India was attended by around 350 people and had 30 talks. I have attended many conferences, but this one was different. This one was where real people, the real developers gave talks and socialized. No enterprise BS, just the real thing*. There were a vast majority of good talks. However, I could only attend a few. Strand use of Python involved explaining how they journeyed from having a little Jython code to hook up stuff to where they have a significantly large Jython code base, was quite interesting. There was a talk on Idiomatic P ython from some one who did python at home, altho’ the only thing his university expected is “C that runs on Turbo C (which is not really a language)”. There was a talk on design patterns that explained various design patters: Singleton, Iterator, Factory Method, Strategy, observer, decorator. Creating a singleton using decorators is a nice little thing I got out of this talk. The talks on using Build out for deployment and various testing frameworks of Python, and the keynote byÂ Prabhu Ramachandran, are some other talks I would have liked to attend. A long session on Introduction to Python by a few experts, helped a lot of the begginers. 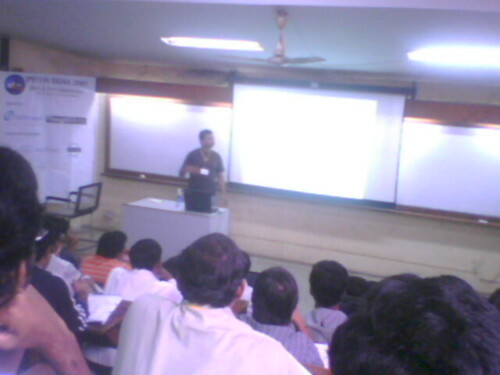 I, along with 2 fellow Hyderabad django developers, presented a talk on Django. The event was well organised in many ways. It could have been better in some areas tho’. Connectivity and electrical points to charge laptops were short of the need. Surely, a real time twitter stream from the event could benefit a lot. While infrastructure can be improved for the next event, surely it is a superb start in the right direction. There are quite a few companies, that work on Python in the Indian valley, this event is likely going to be big pretty soon. *PS: This should perhaps come as a nudge to Joel and Jeff to conduct Stackoverflow dev days in India too; after all, here is where stackoverflow gets the third highest traffic from. If you are a good developer from India reading this, you should know that, we are hiring. We develop Web application using Django. We do Agile Software Engineering and not layers of hacks. The most depressing thing I can hear is... "it's just a job". How depressing is that? You spend 8, 10, 12 hours per day there. and it's "just a job"? If it strikes a chord, send us your resume.Â We offer great working environment, competitive package and multiple large monitors to work with. Thank you for reading the Agiliq blog. This article was written by lakshman on Oct 2, 2009 in Uncategorized .